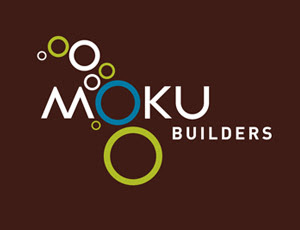 We've been working on the new brand ID for MOKU Builders of Maui Hawaii for the past month or so at Design Hovie Studios. It's nice to get in a tropical state of mind when in Seattle in January. I'm very excited about the logo as it breaks out of the traditional logo box. It's fun with movement and action but still professional and in keeping with the Island aesthetic. Granted the unusual shape makes it more difficult to work with in layouts but, in the end, I think it will yield more interesting results. In addition to the logo above, we've created business cards and are currently designing a brochure and presentation folder for the company.